Rare Earth Element (REE) mining, processing and exploitation are large scale industries that use a wide range of chemical substances and generate significant quantities of waste. Additionally, the ores contain variable amounts of impurities such as non-target toxic metals, fluorine and radionuclides that may be released from the ore during processing into the product or waste streams, and/or represent safety issues to the workers. Past REE mining and processing has led to significant environmental impacts in several countries, including Brazil, China and the USA (EPA, 2012). In addition to the environmental damage caused, remediation of contaminated sites can be expensive. For example, the estimated cost of remediating the Mitsubishi REE processing site in Bukit Merah, Malaysia is $100 million (Bradsher, 2011). It is therefore important to ensure that the regulatory framework in the EU will support the development of a well managed REE industry with acceptably low environmental impacts and a negligible effect on human health. Radioactive daughter products (decay products) of primordial radionuclides. The decay chain of 238U is shown in Figure 1. Cosmogenic radionuclides such as 14C, 7Be and 3H. These form due to the interactions of stable isotopes with cosmic rays and the concentrations of Earth are not of concern. Activities involving materials with background concentrations of naturally occurring radionuclides are exempt from the EU’s radiation protection regulations (Basic Safety Standards, 2013), to avoid the need to regulate the use of virtually every material on Earth. The point when the mining and processing of an ore (and other specified activities) require regulation is when the material contains more than 1 Bq g-1 of the radionuclides in the 238U or 232Th decay series, or 10 Bq g-1 40K (Basic Safety Standards, 2013). Some REE ores contain U and/or Th at elevated concentrations due to mineralization processes, although the concentrations vary widely. When REE ores are not exempt, there is a need to handle the materials, processes and wastes according to the EU’s Basic Safety Standards (2013). This new directive has integrated NORM into its overall requirements, meaning that industries processing NORM will be managed within the same regulatory framework as other practices. The new definition of a "practice" is a human activity that can increase the exposure of individuals to radiation from a radiation source and is managed as a planned exposure situation. Norra Kärr in Sweden is an example of a REE ore body with background radioactivity that is exempt from the Basic Safety Standards, whereas the uranium content of Kvanefjeld ore, Greenland, is sufficient for it to be an additional commodity. The clear definition of NORM that require regulation in the Basic Safety Standards is important and will help protect workers in the EU REE industry and the public from ionising radiation. Inadequate legislation has been shown to result in exposures in the REE mining and processing industries, for example a significant relationship has been found between the inhalation of Th-containing dusts and lung cancer in miners in a 20 year study at Bayan Obo, China (Chen et al., 2006); two REE processing plants and a waste facility in Brazil became contaminated with Th and its daughters (Lauria and Rocheda, 2005); and workers have received elevated doses in the REE industry (IAEA, 2011). The control of radionuclides is therefore important from mining through to processing. The different radionuclides in the 238U, 235U and 232Th decay chains may be separated from the REE, and each other, during beneficiation and processing. The point at which separation occurs is determined by the chemistry of the elements and their physicochemical associations in the ore. After separation from their long-lived parent isotopes, the activity of short-lived radionuclides decreases over time and is considered to reach background after 9 half-lives. Therefore, the fate of the longer-lived radionuclides is of most importance during chemical processing and it is important to ensure that their concentrations in the final REE products are of no radiological concern. Short-lived daughter products “grow” back in after separation, due to the on-going decay of their parent isotope, and equilibrium is obtained after ~9 half-lives (of the daughter) have passed. 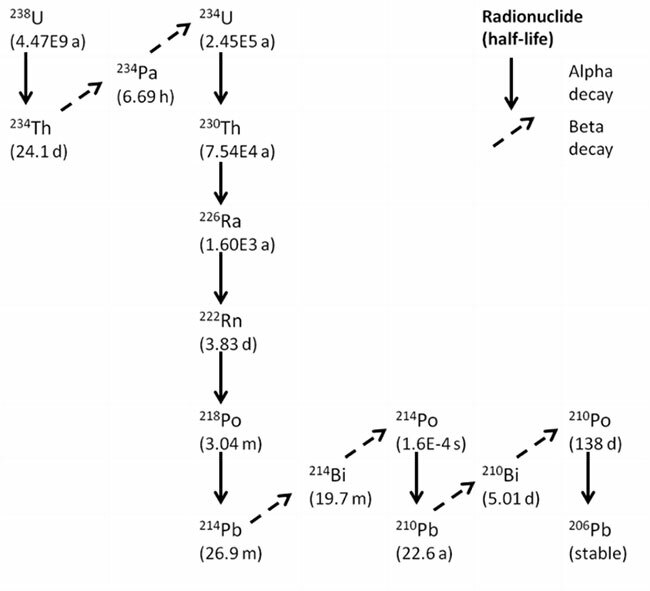 Examples of radionuclide partitioning during REE processing are given by the IAEA (2011). The most significant environmental impact of REE mining is often on the surface- and groundwater quality as seen at Bayan Obo, China (Schüler et al., 2011) and Mountain Pass, USA (EPA, 2012). The large volumes of tailings that are generated during hard rock mining are a source of waterborne contamination. Tailings are also a major environmental hazard if the tailings impoundment dam fails. Dust and gaseous emissions are also important vectors for both environmental contamination and the exposure of workers to toxic substances. For example, processing at Bayan Obo has led to the release of fluoride, dust and waste gases containing HF and SO2 (Schüler et al., 2011). 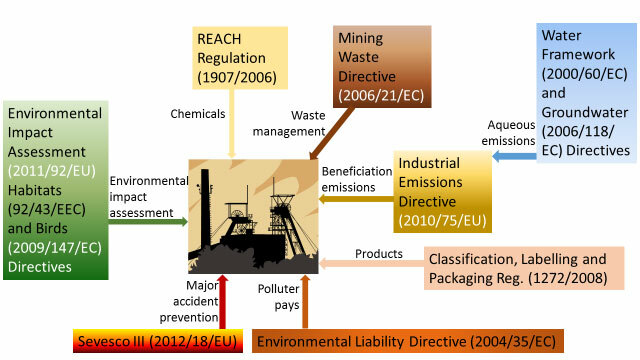 The main European environmental legislation that is relevant to mining and beneficiation is shown in Figure 2. 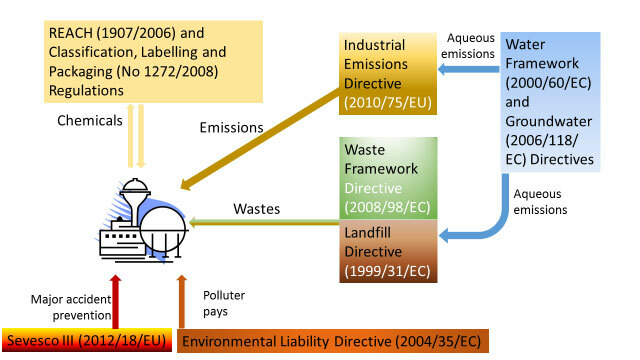 Similarly, the main EU environmental legislation for mineral processing is shown in Figure 3. These sets of environmental legislation are supplemented by the environmental protection against radioactive contamination offered via the protection of human health in the Basic Safety Standards (2013). The industrial processes developed within the EURARE project will be examined in terms of their potential environmental impacts and the legislation will be examined to ensure it covers the potential hazards associated with the industry. Best available technique reference documents (BREFs) are used in the EU to promote good environmental practice and are defined in the Industrial Emissions Directive (2010/75/EU). They are written through an exchange of information with stakeholders on existing processes in a defined industry. The techniques that are most effective in achieving a high level of protection of the environment as a whole are then selected by a committee procedure. They are therefore descriptive rather than prescriptive and should be the reference for setting permit conditions within the relevant industry. Each BREF document must be reviewed and updated at least every 8 years to drive forward improvements in environmental performance. The tailings management and industrial processes developed in the EURARE project will contribute to this on-going process. Health and safety issues in REE mining and processing, an internal guidance report. WP6 of the EURARE project. Past experience of environmental, health and safety issues in REE mining and processing industries and an evaluation of related EU and international standards and regulations. Keith-Roach M.J., Grundfelt B., Kousa A., Pohjolainen E., Magistrati P., Olivieri N. and Ferrari A. Basic Safety Standards (2013). Council Directive 2013/59/Euratom of 5 December 2013 laying down basic safety standards for protection against the dangers arising from exposure to ionising radiation, and repealing Directives 89/618/Euratom, 90/641/Euratom, 96/29/Euratom, 97/43/Euratom and 2003/122/Euratom. Official Journal of the European Union vol 57, L13. Chen X.A., Chen Y.G., Xiao H.J., Feng G.D., Deng Y.H., Feng Z.L., Chen L.A., Han X.M., Yang Y.J., Dong Z.H. and Zhen R. (2003). 20 year follow-up study on the effects of long-term exposure to thorium dust. Chinese Medical Journal 116, 692-694. EPA (2012), Rare Earth Elements: A Review of Production, Processing, Recycling, and Associated Environmental Issues. EPA/600/R-12/572, U.S. Environmental Protection Agency. Industrial emissions directive (2010). Directive 2010/75/EU of the European Parliament and of the Council of 24 November 2010 on industrial emissions (integrated pollution prevention and control). Official Journal of the European Union L 334/18. International Atomic Energy Agency (2011). Radiation protection and NORM residue management in the production of rare earths from thorium containing minerals. Safety Report Series No 68. International Atomic Energy Agency, Vienna, Austria. Lauria D.C. and Rochedo E.R.R. (2005). The legacy of monazite processing in Brazil. Radiation Protection Dosimetry 114, 546-550. Schüler D., Buchert M., Liu R., Dittrich S. and Merz C. (2011). Study on rare earths and their recycling. Final report for the Greens/EFA Group in the European Parliament. Öko Institut. http://www.oeko.de/oekodoc/1112/2011-003-en.pdf. [accessed 14/05/2014].